You instead see this ugly pile of unstyled text. Come to think of it, it doesn't really look like an ugly pile of text. Tell you what, just take our word for it. Now, before you hit our support page and tell us how we screwed up this update, read the little blurb below about one teeny, tiny issue about the action box styles. like to design their own action box styles and now find that their action boxes looks ugly (unstyled) after upgrading to version 2.8. If the two criteria above applies to you, then know this, you can fix this. Read on how. Basically, the issue is the result of an improvement to the way you create action box styles. Where previously any styles you created apply only to that one action box you created it in, now, styles are created globally and can now be applied to multiple action boxes. So, where previously, if you had 15 different action boxes and you wanted all 15 action boxes to have the same style – a style you proudly came up with – you had to go through each action box and set each action box style settings. One by one. All 15 of them. But with version 2.8+ you just create one style that you assign to all 15 action boxes and avoid getting Carpal Tunnel Syndrome as an added benefit. Lovely. “But I’m still seeing this ugly pile of text!”, you say. Not for long. MAB Update Tool to the rescue. What this tool does is it takes the styles you’ve created prior to upgrading to version 2.8+ and saves it as a global style – hence the button Globalize Style. Red indicates action boxes where you are using your own created styles and you haven’t converted the style yet. 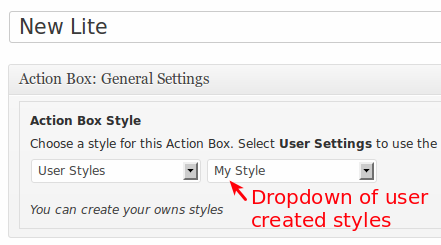 After clicking on the Globalize Style button, visit Magic Action Box Settings › Styles and Buttons to make sure that the style you created previously has been converted to a global style. 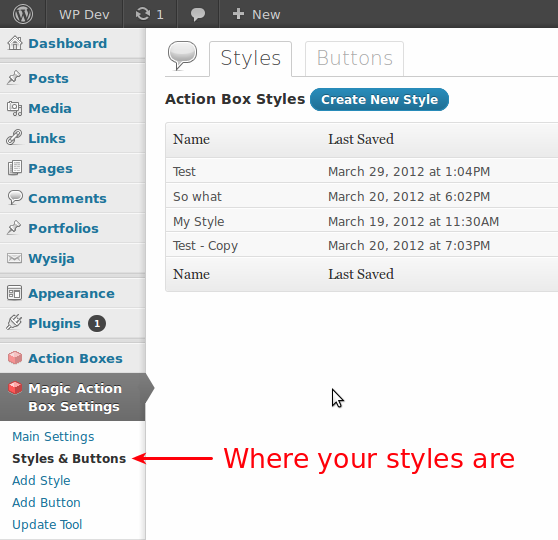 Next, edit each action box that need to use the style that you just converted and assign that style to the action box. Save. And you’re done. Ugly pile of text gone. If you’re still seeing the problem, try using the Clear Cache button found under Magic Action Box Settings › Main Settings › Other Settings Section. If that still doesn’t solve it, that’s the right time to tell us about it. I have popped the magic action box at the top of my home page but it doesnt display the area for people to add their name and email address. Thanks for trying out the plugin. What version of MAB are you using? The Lite version or the Pro? Can you email us a support ticket at support@prosulum.zendesk.com? When you do can you send us the HTML code that your autoresponder gave you? Hi Debbie, thank you for checking out Magic Action Box.